All of our puppies come with a strict Spay/Neuter Contract and a 2 year Health Guarantee. If you would like to purchase a puppy, we require a $500.00 non-refundable deposit to reserve a spot on our master list. We keep separate lists for each type of bernedoodle and your deposit is transferable to different types/sizes. We cannot guarantee color or size but we can guarantee a happy and healthy new family member. 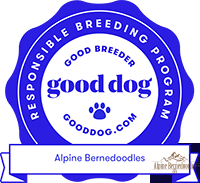 If you are interested in purchasing a puppy for breeding purposes, please contact us prior to sending an application to discuss our breeding policy and contract. Please feel free to contact us prior to submitting an application to answer any questions you may have about bernedoodles or our program. Once an application has been submitted and approved, a deposit will hold your spot in line. The master list will go in order of date the deposit is received. Due to family privacy, we do not display our master list on the website. A list will be sent to each applicant prior to a litter being born, then an updated list will be sent again after the current litter has been chosen. Puppies will be available to choose when they are 6 weeks of age according to the order of the master deposit list. We will contact you by phone, text or e-mail, so please keep your contact information current. We ask that you respond within 12 hours with your puppy selection. If you do not respond, we will move on to the next person on the deposit list. Everyone is anxious to choose their puppy, so please make note of the timing for the adoption date. You may remain on the master list until you choose your puppy. If you pass on any litter and prices change before the next chance to choose, you will be charged the new price. Due to health risks to young puppies ie: Parvo, Distemper, etc. being brought in and Momma dogs protectiveness and stress around strangers, we allow one visit per family on the deposit list. If you would like to pick out your pup in person, arrangement must be made in advance. ​Full payment, along with any shipping or transport fees must be paid within 5 days of choosing your puppy. No payments will be accepted on puppy pick-up day, unless prior arrangements have been made. Puppies will be ready for their new home at 8 weeks of age. We will keep your puppy through the normal pick-up week without any additional charge. After 7 days, a $20.00 boarding fee per day and any additional vaccinations will be charged.